In my last post, several readers expressed an interest in the Mark Twain house. So here’s more about it. Samuel Clemens (Mark Twain) was newly-wedded to Livy Langdon when they moved to Hartford in 1871, to be closer to Clemens’ publisher. Livy was already good friends with John and Isabelle Beecher Stowe, who lived in the Nook Farm neighborhood of Hartford. Clemens had this house custom-built on a parcel of land on Farmington Avenue, right near the Stowes and other prestigious families of Nook Farm, and the family moved there in 1874. The 14 years the family lived here was a happy time for the Clemenses. They educated their children in the schoolroom; entertained noteworthy journalists, authors, explorers, and civic leaders in the impressive dining room; played billiards in the billiards room; and put on family plays in the library. Twain was at his most prolific while living here, writing many of his best works: The Adventures of Tom Sawyer, The Prince and the Pauper, The Adventures of Huckleberry Finn, and of course, A Connecticut Yankee in King Arthur’s Court. Cool features: carved teak panelling, specialty wallpapers, bells, speaking tubes (sort of an intercom system), a telephone, burglar alarm, central heating, and extensive indoor plumbing. Speaking of the telephone, Clemens had sort of a love/hate relationship with it. Click here for a humorous article of Clemens’, titled “A Telephonic Conversation” from the archives of The Atlantic. It’s a hoot. Clemens even wrote to Gardiner G. Hubbard, the father-in-law of Alexander Graham Bell, complaining about how bad his telephone service was in Hartford. Apparently, Clemens kept getting cut off while he was practicing his cursing. He addressed the envelope to “The Father-in-law of the Telephone.” You simply cannot make this stuff up. Here’s the link to the envelope image. My favorite room when I visited? 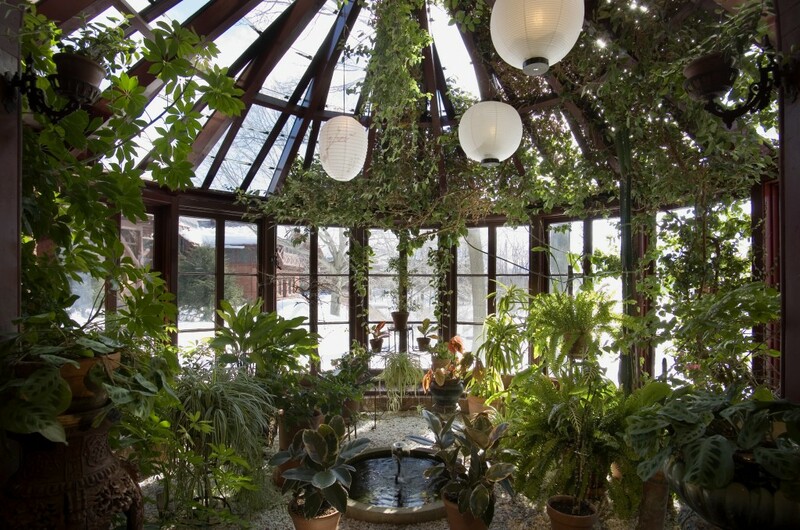 The library, which opened on to a beautiful conservatory filled with lush plants. If your travels ever take you near the Hartford area, the exhibit is worth a visit! Here’s a link to visitor info.